I’m releasing my in-house tool for Drupal to WordPress migration. You can go directly to the download page for the latest version of the utility. If you’d rather let someone else do the work, you can find more information at my dedicated migration service page. When I started Another Cup of Coffee, we specialized in setting up Drupal since it was—and still is—a very versatile content management system suitable for anything from simple ‘brochureware’ sites to online shops and social networking. One of my working assumptions was that website owners would appreciate a platform that offers more flexibility as their needs expanded. However, over the past few years, I’ve received quite a few requests from new and existing clients to migrate sites from Drupal to WordPress. At first it seemed a little odd that it was almost always in this direction and rarely the other way around. 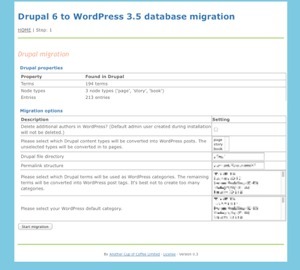 Some investigation quickly brought out an obvious answer: there is a Drupal module called wordpress_migrate that supports migrating WordPress blog exports into Drupal, but no simple mechanism to convert Drupal nodes into WordPress posts and pages. After many years of experience with running Drupal sites, I can understand why a certain type of website owner would prefer WordPress. It’s just much more suited to the non-technical user who just wants a simple site with fairly standard functionality. (Incidentally, this describes our target market.) Since I’d first started using WordPress in 2004, it has evolved from simple blogging software into a fully-fledged content management system. Further, it’s more user-friendly out-of-the-box than Drupal’s default utilitarian interace and has a simpler update system. From my own experience, Drupal maintenance can be quite demanding with its frequent core and module updates. WordPress, on the other hand, is refreshingly easy to maintain. Unfortunately for us, manually moving a client’s site from Drupal to WordPress was quite tricky and time consuming, especially when lots of content types and entries are involved. We obviously needed some sort of automated tool but to my surprise, all that I could find online were either articles about people experimenting with SQL scripts, or paid-for services like GoWordPress and cms2cms. Our margins are pretty tight and paying for the service just wasn’t an option so I decided to hack together some scripts to build our own in-house tool. A blog post by Scott Anderson at Underdog of Perfection provided the best steps to get me started. After using our tool to migrate a fair number of sites, I realised that it was time to give back to the community. After all, my code built upon the efforts of others who freely shared their work. I’m therefore releasing our Drupal to WordPress Migration Tool for public use under the MIT License. I’ve set up a dedicated page for downloading our Drupal to WordPress Migration Tool which will have the most up-to-date version. More feature-rich versions can be found there as feedback comes in and bugs are reported. The first version should definitely be considered a ‘beta’ and only used by people who know what they’re doing when it comes to setting up and configuring content management systems. Currently it supports only Drupal 6 and WordPress 3.5. Eventually I aim for it to be a ‘wizard’ style utility that can be used by less technical people, like web creatives who’ve been tasked with migrating their clients’ sites from various releases of Drupal into the latest version of WordPress. If you’re unsure of how to proceed or would simply like someone else to do the work, please drop us a note and we’ll be happy to provide a quotation. Go to the download page. IMPORTANT: I’m offering this tool with no warranty or support implied.